Journey into the heart of the mesmerizing countryside of Tuscany to San Gimignano and Siena in the comfort of your private deluxe vehicle driven by your personal Stefano Rome Tours knowledgeable English speaking Driver who is dedicated to making your excursion to Tuscany a memorable experience you will treasure for life. Your professional English speaking Driver will meet you at your ship 8:00 AM holding a sign bearing your name and bring you back at 5:00 PM. 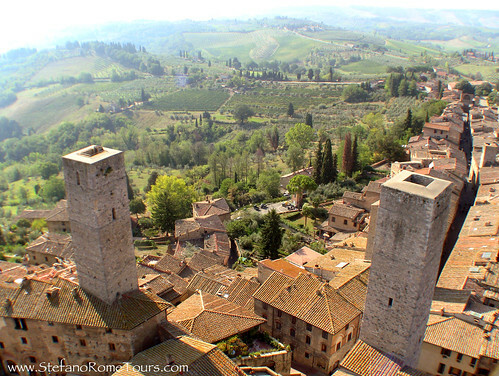 Wish to visit Siena and San Gimignano from your Florence accommodation? Please see our Essence of Tuscany tour available from Florence accommodation that also includes the beautiful Monteriggioni. You will enjoy a pleasant drive through the enchanting region of Tuscany to your first destination, Siena. 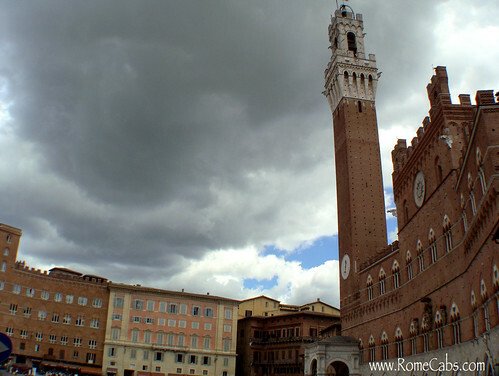 Siena’s history extends as far back as Ancient Rome as a Roman colony. For centuries since, Siena grew into a prosperous significant medieval town, a rightful rival to the neighboring Florence. In the 14th century it’s fate and fortunes fell due to pestilence and banking decline. Construction and expansion abruptly stopped, and with little subsequent development and industrialization Siena inadvertently preserved its medieval architecture, culture, and traditions that we enjoy today. Among the historic traditions that date back to ancient tribal systems retained in Siena, is the town’s 17 districts (contrade)- each with its own coat of arm and strong identity. This is most prevalent every July 2 and August 16 during the Palio delle Contrade, the famous precarious horse racing around the perimeter of the town’s main square, Piazza del Campo. Siena is small enough in size to be enjoyed on foot to enhance your experience. It’s brimming with outdoor cafes, shops and boutiques that sell locally crafted products, and with the perfectly preserved medieval buildings you feel you’ve just stepped back in time a thousand years while enjoying modern day amenities. From Siena you will be on your way through the countryside of Tuscany to your next destination, the world famous San Gimignano. Resting on a hilltop overlooking the Elsa Valley, San Gimignano has rightfully earned its reputation as the Medieval Manhattan of Tuscany. While in San Gimignano, you driver will offer suggestions for lunch as there are many restaurant opportunities for varying tastes and budgets. San Gimignano's history is ancient, founded in 3rd century BC by the Etruscans, with documented records beginning in the 10th century when it adopted the name of of the bishop of Modena who defended it from Attila’s Huns, Saint Geminianus. Due to its location along the “Via Francigena”, San Gimignano’s wealth and architectural development flourished during the 11th and 13th centuries. Unlike many Italian medieval villages that have lost their towers due to urban renewal, wars, or natural disasters, San Gimignano preserved 14 of its original 72 towers which have become its international symbol and pride. Its historic center is a UNESCO World Heritage Site. Among these magnificent towers are narrow winding lanes that add to the charm of this medieval town. The main square in town is Piazza della Cisterna, a charming triangular square surrounded by beautiful medieval houses, palaces and towers surpassing rooftops. Shops, cafes and boutiques offer locally crafted products and delicacies. In the center of the square is the restored 14th century well on whose steps locals and visitors alike gather to enjoy the beauty that surrounds them...and also enjoy some of the best gelato in Tuscany that is available at the gelateria in the square. From here you will enjoy a relaxing drive through the Tuscan countryside on your way back to your ship in Livorno. Thank you very much for choosing Stefano Rome Tours for your Shore Excursions and Day Tours in Italy. We look forward to see you soon in Italy! * The Tour Price for “Siena and San Gimignano” includes your own personal English speaking Driver with a private deluxe vehicle, VAT tax, fuel cost, insurance, and all applicable toll and parking fees. * The Tour Price for “Siena and San Gimignano” does not include entrance fees to paid museums or monuments, lunch, gratuities, licensed tour guides hired separately, or any other personal guest expenses. * Payment for the tour will be made in Euro funds at the end of your journey, and paid directly to your Driver. You may also pay in advance in full amount via PayPal. Just let us know when you tour is confirmed if you wish to prepay. * Your Driver is not a licensed tour guide, therefore it is unlawful according to Italian laws aimed at protecting the integrity of licensed tour guides to accompany guests away from the vehicle. Your driver is obliged to remain with the vehicle while you are sightseeing. * Your driver can suggest options for lunch, but if you have a preference please discuss with your driver first so he or she can make recommendations. * If you are pleased with the service you receive from your driver, a 10-15% gratuity is customary in Italy. Save significantly on this Shore Excursion from Livorno Cruise Port by sharing your tour with fellow cruisers for up to 8 guests per minivan. It is quite simple: just place an ad on Cruise Critic’s roll call with a link to this tour page and invite other cruisers to join you. Don’t worry, we never ask for your credit card information, demand advance payments to reserve your tours, or penalize you with cancellation fees. We operate on the traditional Honor System, therefore we kindly ask that all cancellations be made at least 7 days in advance so we can rebook your service and your reserved driver does not lose work for that day. Cancellations must be made via email and confirmed by us so we have it on record. We do not accept cancellations by telephone, text message or 3rd party. We sincerely appreciate your cooperation and consideration.